While checking fields this morning, IREC Director Rob Wilson ran into some interesting guests enjoying the alfalfa. Perhaps they are collecting data for our researchers, or they are conducting their own taste tests. Either way, we welcome their company! Save the Date for the IREC Field Day! 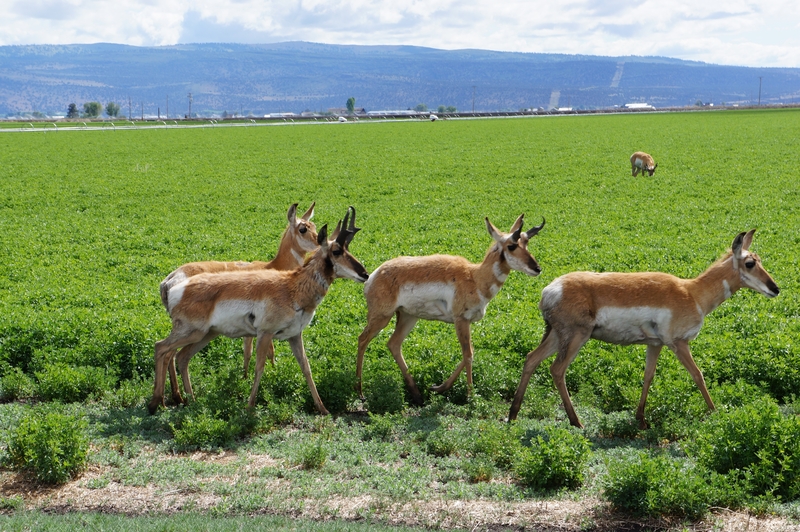 Tulelake is the place to be on August 13, 2014, for the Annual Intermountain Research and Extension Center Field Day! We have many activities planned, so there is something for everyone! Our special theme this year is the celebration of 100 years of UC Cooperative Extension. Learn about the history of Cooperative Extension in Siskiyou and Modoc counties, as well as at IREC. Take a guided field tour to learn about the important research happening here. With our researchers as our guides, we'll learn about the different crops grown in our area. Meet with local, state and regional growers, industry personnel and UCCE staff. Share your experiences and glean insight into how to make tomorrow better. Maybe make a new friend or two. Finally, enjoy a piece of birthday cake and home-made ice cream to top off the celebration! 2013 IREC Field Day participants learn about onions. 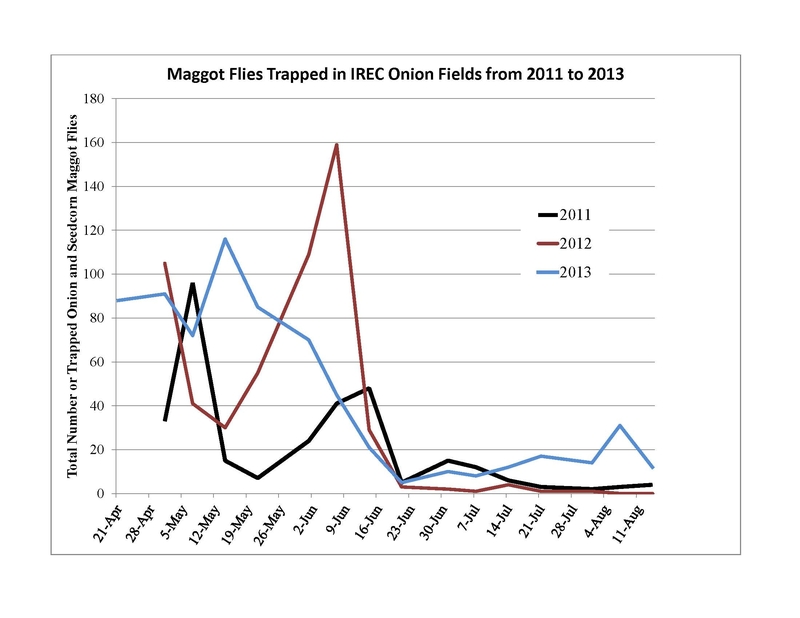 Water availability is still uncertain, but the probability of maggots infesting onion fields this year is nearly guaranteed. 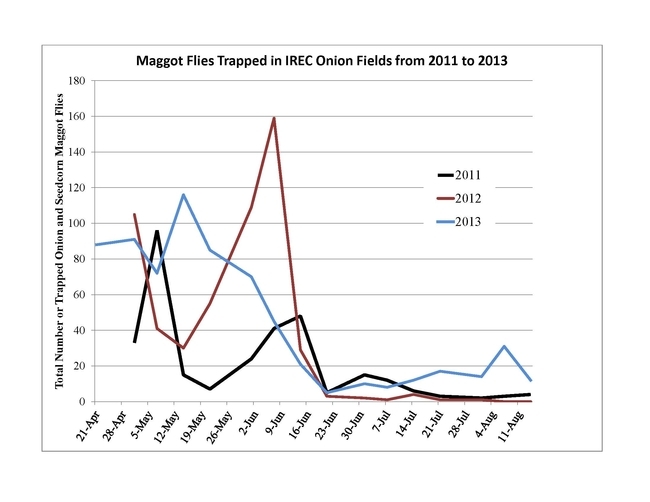 Over the last three field seasons, we conducted several experiments at IREC examining insecticides applied at planting for protecting onion stands from maggot damage. Our results show seed treatment with OI500 (spinosad) was the most effective all three years. The next best labeled option was Lorsban applied in furrow at the maximum label rate. In untreated plots, onion stands were reduced at least 50% from maggot feeding compared to those treated with an insecticide. During the study we trapped maggot flies to determine when adults emerge and deposit eggs in onion fields. The results from 2011, 2012, and 2013 are shown in the figure below. All three years, seedcorn maggot and onion maggot flies were found in the traps. Researchers in New York and Canada have developed degree day models to predict fly emergence based on air temperatures. 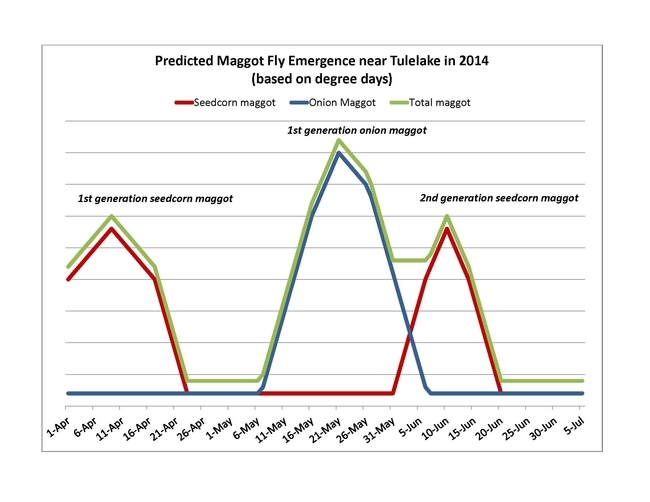 Using Tulelake weather data, we compared their predicted emergence dates with fly counts from 2011-2013. Most years, the predicted emergence date came close to matching elevated fly counts. Below is a graph showing predicted emergence of seedcorn and onion maggot using 2014 weather data. First generation seedcorn maggot flies are emerging right now, and first generation onion maggot are predicted to emerge May 21st. Seedcorn maggot is widespread and most problematic in fields with a lot decaying organic matter especially following alfalfa. Onion maggot is also widespread and infests many fields each year. Onion maggot overwinter in onion cull material and flies deposit eggs at the base of onions plants. Onion maggot is most problematic in fields located within 0.75 miles of old onion fields with cull material left in the field. Looking at 2014 fly emergence predictions, maggot larva will attack onions at sensitive growth stages in fields planted now to mid-May. If onions maggot is expected to be problematic, consider planting in early to mid-May to avoid time flies have to oviposit on onion plants. 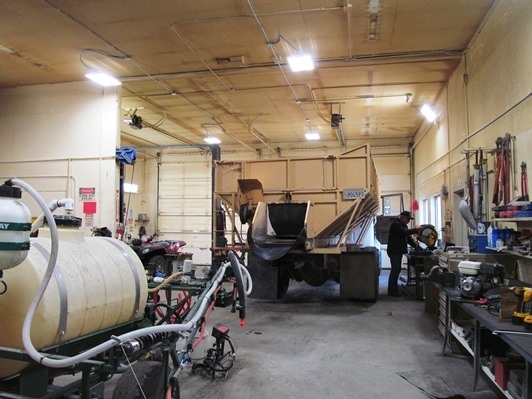 Thanks to ANR Be Smart About Safety (BSAS) funding, new LED lights have been installed in the IREC shop. These new lights are bright, efficient and mercury-free. They make the shop safer for prepping field equipment or while making repairs. Senior Farm Machinery Mechanic Greg McCulley is readying farm equipment in the brightly lit shop. 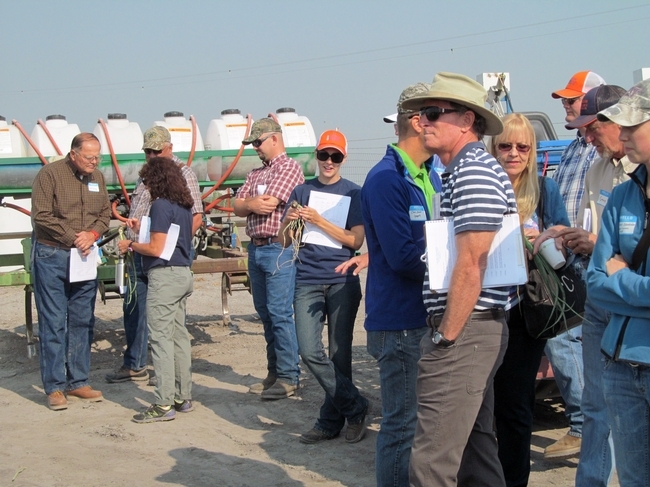 Thank you to area growers and industry personnel for attending the 2014 Tulelake Alfalfa and Small Grains Spring Meeting. I think all will agree that the topics were informative and timely. Ron Quigley, Deputy Director of Emergency Services, Siskiyou County, updated the audience regarding the current drought situation, and asked that farmers and ranchers complete a survey of their losses due to lack of water. Here is the link to the Siskiyou County Emergency Services website. Siskiyou County Emergency Services Department. Thank you, Ron. Steve Orloff, UC-CE Siskiyou, and Rob Wilson, IREC Director, spoke on several issues involving grain and alfalfa. For those interested, the title of their topics and PowerPoint presentations are attached below. Thanks to Steve for making the drive over. Looking forward to next year's Tulelake Alfalfa and Small Grains Spring Meeting!